Anya McCoy is a pioneer of natural perfume, and community leader in the art. In 2013, she became the first artisan natural perfumer nominated to the American Society of Perfumers. She has mentored hundreds of perfumers, and continues to explore techniques and perfume making processes to assist in the elevation of the art. She is the President of the Natural Perfumers Guild, and wrote the first American textbook on perfumery, which is used in her courses at the Natural Perfumery Institute. In my professional making perfume course, I instruct students in the art of perfumery from the first drop to the final product. There are many bonus modules for fragrant products, including potpourri, body butter, scented body powder, enfleurage, and many more that allow you to be a multi-faceted perfumer. 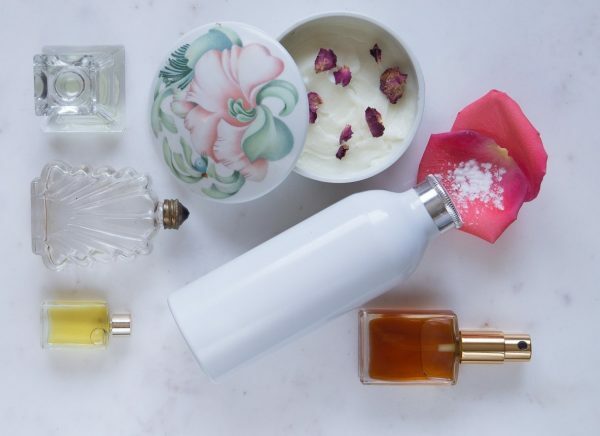 This entry was posted in How to Make Perfume, natural aromatics, natural perfumery course, Natural Perfumery Institute, study perfumery on April 6, 2019 by Anya. This unprecedented, comprehensive guide from renowned perfumer Anya McCoy is an inspiring resource for anyone interested in creating artisanal perfume at home. Discover simple step-by-step methods for making perfume without harsh chemicals. Jump right in, using local plants and common household ingredients. Soon you’ll be building your own scent collection and creating unforgettable gifts for friends and family. This book covers a variety of techniques for capturing fragrances from natural materials, making it easy to choose the project that works for your schedule and experience level. Source your own organically grown botanicals, and enjoy the earth-friendly benefits of creating your own essential oils and extractions sustainably. Make your own all-natural perfumes, room and linen sprays, body butters, massage oils, and more. Explore the nuances of scent blending to create delightful fragrances that are unique to you. Packed with easy methods and expert guidance, this book will become an indispensable reference as you grow into a confident scent designer. This entry was posted in Anya's Garden Perfumes, DIY, enfleurage, Healthy perfume, Homemade Perfume book, How to Make Perfume, Hydrosols, natural aromatics, natural perfume, raw materials of perfumery, study perfumery and tagged absolutes, DIY, essential oils, homemade perfume, hydrosols on July 1, 2018 by Anya. Jasmine Syrup Perfume for your mouth! 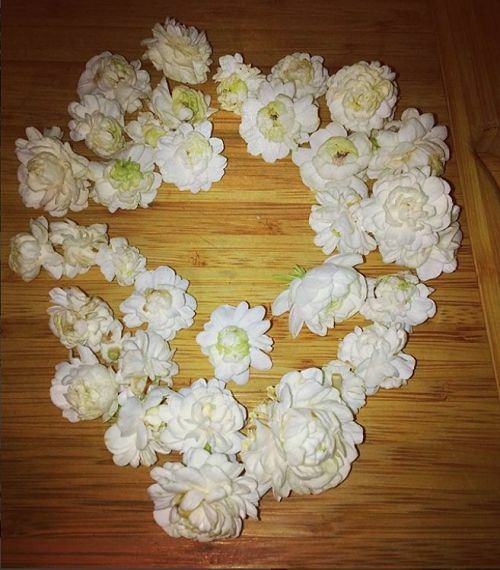 So many jasmines, so much fun! You can do this with any non-toxic, organic fragrant flower you have in your garden, and the tasty syrup is fabulous in cocktails, drizzeled over ice cream or cake, or anything you can think of! Place the sugar and water in a saucepan, and stir constantly while bringing to a boil. Once it’s boiled, remove from the heat, and add the flowers, gently stirring them into the syrup. Cover and allow to cool or up to three hours. Strain the flowers out, using a stainless steel strainer, into a sterile jar, cover, and refrigerate. This entry was posted in Anya's Garden Perfumes, natural aromatics, natural perfume and tagged jasmine, perfume on June 28, 2018 by Anya. I’ve spent over forty years extracting fragrance from plants, blending those extracts and purchased essential oils and other fragrant materials into perfume. Not just perfumes, but also sprays, body butters, and bath and body scented products. With the publication of Homemade Perfume on July 31st, all of my experience is in one book for everyone! I wish I had this book when I started working with herbs and fragrant plants year ago, and I know you’ll appreciate the detailed information in my book, me passing my hard-earned knowledge down to you. You can pre-order the book on Amazon so you’ll get it immediately after the July 31, 2018 release date by following this link. 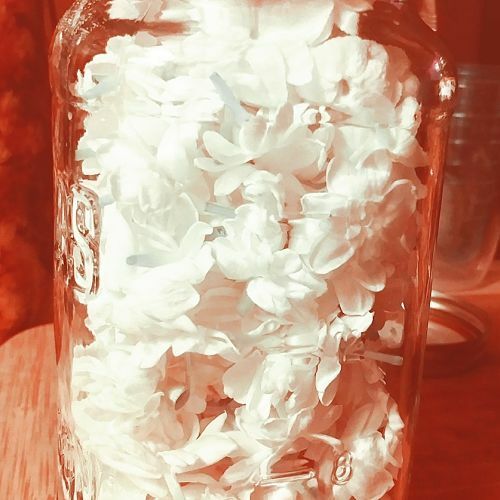 The self-satisfaction of tincturing or infusing that gardenia bush, or preserving the scent of the lily-of-the-valley plants that spring up each year, only to fade is something a DIYer, perfumer, crafter, soapmaker, or just lover of fragrance can enjoy after reading Homemade Perfume. How about turning the peonies or tuberose blossoms into an indulgent body butter or solid perfume? The book is the first of its kind to give detailed instructions on how to do this, and much more. Don’t have a garden with fragrant plants? Well, I hope to encourage you to either start growing them, or seeing with your family or friends or neighbors might be willing to share. There are also instructions on how to extract the scent from fragrant botanicals that you can purchase, such as coriander seed, vetiver, patchouli, and rosebuds (to name a few). These can easily be made into room sprays, oil or alcohol perfumes, and other scented delights. I’ve done this for years, and now you can, too, with guidance and detailed instructions. Help lessen the burden on the Earth by growing your own! Sustainability and self-reliance are satisfying goals, and my book will help you with both. Willing to get ambitious and start distilling, making essential oils or hydrosols? You’ll find what will – or will not – work. Best of all, I share basic perfume making techniques. You’ll learn how to evaluate and record your impressions of the scented extracts, and how to start constructing a perfume, room or body spray, etc. I do teach an advanced course, but for someone not planning to go into the business of making perfumes, Homemade Perfume will give you the knowledge of how to create fun and fragrant projects. I live in Miami, and enjoy the beauty of ylang ylang trees, frangipani, champacas, and other tropical beauties you probably never have experienced. It’s been decades since I breathed in the beauty of lilacs, linden trees, or fresh and lively conifers – so we’re even! Homemade Perfume is written with a mix of all types of plants, from all zones. I supply a table that will allow you to select the type and duration of processing necessary for your plant, in your zone. Have a delicate flower like mock orange? That’s covered. Thick, leathery leaves? Covered? Roots or wood? Don’t worry, you’ll have the hand reference table to help you. Forty plants are profiled in the book for further reference, and the type of fragrant part of the plant will be covered, so you can yes, find if it’s in your garden, or area, and follow the instructions for a successful scent extraction. Other Sources for Supplies – Supplied! I grow a lot of fragrant plants, and have a cabinet filled with my extracts, but of course, I have to buy supplemental essential oils and absolutes to round out my perfume organ. No linden trees here, no pinyon pine, so I have reputable suppliers I depend on for obtaining these oils. The appendix in the book lists these suppliers, plus alcohol, bottle, and many other items you may need. Dear Readers, it’s time to spread the news about Homemade Perfume! Please do two things: Leave a comment, and share this blog post on your social media. Leave me a note about where you shared it: Facebook, Twitter, Pinterest, Instagram, etc. I’m also asking if you can preorder the book on Amazon to help the search engine rating for it. You might think, why do that if I might win a copy? Well, you keep the signed copy and give the Amazon book to a friend! Win all around! What if you’ve already preordered? You might win a signed copy, and yes, give the preordered copy to a friend. I’d still appreciate your comments and sharing! This entry was posted in Anya McCoy, DIY, enfleurage, Healthy perfume, Homemade Perfume book, How to Make Perfume, Hydrosols, natural aromatics, natural perfume, raw materials of perfumery, study perfumery and tagged DIY, enfleurage, essential oils, fragrance, how to make perfume, infuse, perfume gardener, tincture on April 16, 2018 by Anya. This was going to be most heartfelt newsletter I’ve ever sent because I want to share the events of September and October and explain why I’ve been so quiet. Yes, I kept posting on Facebook, but behind the scenes, there is a lot of recovery and catch-up going on in the day-to-day businesses I run. I decided to blog later about the events instead, and just concentrate here on the love and passion for perfumes, and their creation. And I also decided to offer discounts, and pledge 10% of the sales to hurricane relief efforts. Use the links to discounted sale items at the end of this post. I’ll let you know when I have it together enough to write about September and October, it’s just too fresh right now. So a remedy? Share the project that stirs as much passion in me as creating perfumes – teaching others how to make beautiful, professional perfumes! My perfume organ with diluted essences, a working model I introduced to natural perfumery in my Basic natural perfume course. 10th Anniversary of the Natural Perfumery Institute Blew Right By! Something very important to me that fell by the wayside due to Irma was the 10th anniversary of the opening of the Natural Perfumery Institute, an educational place for learning the ancient and modern aspects of natural perfume. It was the first online course in natural perfumery, and I share many years experience with the students in the form of a textbook, a real textbook, the first of its kind for perfumery. I had no time to announce, or celebrate, this milestone, the 10th anniversary. Thinking about the need for such a course, and then developing it, was a goal I accomplished. If you are considering studying perfumery, I am offering an early holiday discount on tuition, the perfume making kits, and select aromatics from my botanicals line. Do you, or someone you love, desire to learn perfumery? This course is dynamic and covers the breadth and depth of the art of perfumery. This page for the $100 to $300 discount on the course tuition and kits. This page for discounts on Boronia, Sandalwood, and Vanilla. These are the only pages coded with the discounts. There will be wonderful discounts on my perfumes next week for Black Friday, so be sure to open your newsletter to see what I’m offering. The tuition and aromatics discount will be available until Thursday, Nov. 23, 2017. Natural Perfumery Institute cover. Textbook written by Anya McCoy. How to extract fragrance from plants. Learn more about the first book of its kind! Publication date 2017. This entry was posted in Anya's Garden Perfumes, How to Make Perfume, natural aromatics, natural perfumery course, Natural Perfumery Institute, raw materials of perfumery and tagged boronia, discounts, perfume kits, sandalwood, study perfumery, vanilla on November 18, 2017 by Anya. In 2003, a member of the Natural Perfumery group I host on Yahoo got in touch with the folks at Allured Publishing (Now Allured Business Media) and asked them if they could make the Perfume and Flavor Materials of Natural Origin (PFMNO) book available aside from the three-volume set written by Steffen Arctander. The other two volumes held little interest to natural perfumers, since they were on the subject of synthetics. It was very difficult to find the PFMNO on eBay or other places for less than a small fortune, often around $700. I had snagged a book for $117 on UK eBay from a retired perfume chemist, but that was a rare score. Allured responded positively, and began selling the volume for about $350, if I recall correctly. That was great, and many snapped it up. I developed a relationship with Allured, and they gave 20-30% off with a coupon code I could publicize. What a great resource for us natural perfumers. In the past few years, Allured has offered fewer books that before, and they are I suppose going through a business model re-do. The main publication I look forward to every month is Perfumery and Flavorist magazine, it’s relevant and educational. So what is the PFMNO book about? Most regard it as the best reference for plant and animal essences used in perfume and flavors. I turn to it often, to clarify a point, dig deeper into research, or sometimes just for fun, to muse about these delightful fragrances we have for our art. Imagine my surprise when I visited Abe Books, a supplier of used books I love for their great prices, and found that they’re now printing PFMNO on demand through Create Space, the branch of Amazon that prints on-demand books. This is where I get my textbook printed (unabashed plug: my perfume course is professional and comprehensive, and comes with a 350-page textbook). Just visit this page on Abe Books and order PFMNO and you won’t be sorry you did. In fact, you should rejoice in this new age of fabulous opportunity to own such a classic book. This entry was posted in How to Make Perfume, natural aromatics, natural perfumery course, Natural Perfumery Yahoo group, raw materials of perfumery and tagged arctander on November 2, 2017 by Anya. A perfume of color changeable tinctures from an organic garden in Miami, Florida. Read about a giveaway of this perfume, below. Anya McCoy, perfumer, botanist, and founder of Anya’s Garden Perfumes in Miami has released Strange Magic, the first perfume composed of about 95% organic fragrant tinctures. Strange Magic is made with tinctures that reveal hidden colors in the flowers, leaves, and roots when they were placed in the alcohol. Anya has tinctured for herbal purposes for forty years, and for perfume purposes for twenty years. It wasn’t until she dropped snow white Michelia alba flowers into the alcohol and saw the alcohol turn pink, then red, then dark red that she realize there was some hidden secrets in some flowers – Strange Magic. The magic appeared a few years ago when she dropped a handful of white Michelia alba flowers into 190 proof alcohol. She wanted to make a fragrant tincture of this delicious smelling flower to add to her array of natural raw materials for her perfumes. As soon as the flowers started to sink into the alcohol, the alcohol took on a pink tinge. It was quite startling, and by the second day, the alcohol was a light shade of crimson. The more flowers added to recharge the alcohol with scent, the deeper red the menstruum got, eventually becoming burgundy/opaque. Some said it was the dyes or waxes in the flowers revealing themselves, but she said it was Strange Magic. Plant dyes have been known for thousands of years, but the colors extracted are somewhat related to the original plant material’s color. Onion skins make a golden dye, blueberries a bluish dye, and so on. She’s tinctured herbs, woods, roots, leaves, and flowers for many years, beginning with simplers herbal tinctures. What an epiphany the white champaca flowers were. Numerous tinctures that had changed color now flooded her consciousness. The yellow ylang ylang flowers turned the alcohol olive green, and eventually opaque, like the Michelia. White jasmines such as the sambac Grand Duke of Tuscany turned deep gold. White gardenias and tuberoses again – deep gold. She had been using the orangy/brown jasmine absolutes and concretes from the 70s, but never put the color change together until the white champaca. She’d never seen any talk of the color change on any of the aromatherapy or perfume forums she’d been on for decades, other than the color change mentioned was the blue azulene color that developed when chamomiles were distilled, everyone seemed entranced by that. The azulene is not present in the fresh flowers, but develops in the distillation process.But white jasmines turning orangy/brown? No. No discussion. Ylang Ylang essential oil is pale yellow. The absolute of the same flower? Green. Her tincture? Dark Green. It’s the alcohol wash of the concrete that reveals the green color, and the alcohol menstruum I used. Well, it’s time to honor the Strange Magic of color change that happens, don’t you think? Artisan perfumers can work with sustainable fragrance materials with a “grow your own” plan to harvest and tincture the fragrant plants. If they can garden, and have suitable space in the garden, it’s possible to lessen the carbon footprint associated with purchasing essential oils and absolutes. All that’s needed is 190 proof alcohol, and harvesting and recharging the alcohol to make the tincture strong with fragrance. It is not a fast or rushed process: Anya and her assistants spent many hours over the years hand-harvesting the flowers, placing them in alcohol, straining them out, recharging them over and over. If you know the heat and humidity of Miami, you know the dedication this took. Some tinctures have been recharged dozens of times to reach the scent strength desired. Still, it is worth it because the cold process, with no heat destroying some of the more delicate floral notes, and the sustainability of producing some of the raw product on-site are dual bonuses of the eco-conscious perfumer. Anya is currently in discussions with publishers about a book she has written Perfume From Your Garden. It’s the first of its kind, detailing extraction methods for the perfumer, soaper, gardener, hobbyist, or DIYer who wishes to capture the fragrant plants from their garden at the height of their beauty. Until June 20, 2017, there is a chance for you to win Strange Magic by registering and commenting on the Cafleurebon review of the perfume. This entry was posted in Anya's Garden Perfumes, Healthy perfume, How to Make Perfume, natural aromatics, natural perfume, raw materials of perfumery and tagged strange magic, tinctures on June 18, 2017 by Anya. I started collection essential oils and absolutes in 1966. At the time, I didn’t know my bottles of aromatics were supposed to be arranged on a tiered shelf called a perfume organ. Because I was a botanist, I categorized them by the part of the plant they were extracted from: florals, woods, leaves, etc., and kept them in plastic boxes for storage. Later, I had a beautiful old wooden printer’s tray, which, when attached to a wall, provided a lovely display for the small bottles, but was impractical for working, and, of course, didn’t hold the larger bottles. In 1990 or so, I stored my perfume organ in a beautiful Thai display case. I finally located a man in Kentucky who made the wooden tiered racks for essential oils you’d see displayed in stores. I carefully measured what I perceived I’d need, and sent him the information. He constructed a lovely, modern-looking perfume organ out of pine, sweet and pale yellow and perfect for my needs – at the time. All my bottles, except the ones that needed refrigeration were on the organ, interspersed with the dilutions I used in everyday blending. The dilutions sat right next to the undiluted aromatics, and that was okay for a while. Ah, visual serenity, aesthetic beauty, and so much more refined! This perfume organ should be the desired type for artisan perfumers. Modern, cost-effective, and so easy to use! Top notes are on the top level, middle notes, of which there are hundreds, are on middle levels, and base notes along the bottom. Why dilute your essences? It saves a lot of money, first of all. Imagine using undiluted pricey oils, like rose otto, for all of your mods. Secondly, now you get the scent of the rose “opened up” by the alcohol in the dilution, too. Two great bonuses! Don’t ever struggle with trying to use labdanum or tobacco absolutes by the drop again! The diluted essences are very fluid. Now only dilutions are on the perfume organ. Most are 10%, some higher, some lower. The undiluted raw materials are kept in a refrigerator, with their specific gravity noted on a blending database. You may be able to blend a perfume modification with a diluted essence, but you need the specific gravity to be able to blend any quantity. This is taught in my Intermediate Level Perfumery course. Enroll now in the Basic course, which will prepare you to further your studies at the Intermediate Level. This entry was posted in Anya McCoy, Anya's Garden Perfumes, How to Make Perfume, natural aromatics, natural perfume, natural perfumery course, Natural Perfumery Institute, raw materials of perfumery on April 2, 2017 by Anya. This flower is at the limit of wilting or decomposition that I will allow into my tincture. On-the-spot decisions are necessary when processing botanicals, and hands-on natural perfumers become adept at the process. Like everyone who has progressed with passion, training and persistence to become a perfumer, the new wave of natural perfumers started with an intense love of scents. Many can trace their formative moment – the zing of recognition – when a scent transformed their life, and put them on the path of creation. They probably smelled everything around them (as did I) from grass to dirt, flowers, other people, cement, perfume, cereal, ink, paper, plastic dolls, toys, food cooking, hair, furniture, the air before a storm, rotten wood, burning leaves – in other words, the full spectrum of fragrance in the environment. The natural environment, complex, challenging, and often sweetly rewarding enticed and enchanted us. We were hooked. When the synthetic chemical scents coumarin and vanillin were discovered in the 1880’s, they were quickly added to the corporate perfumer’s palette, and natural perfumery as it had existed up until then disappeared. Looking back in time perhaps four or five generations, it must be acknowledged everyone who loved perfume knew only perfume with synthetics blended in with the naturals. Whether floral and discreet, or Oriental and animalic, loaded with civet, musk, castoreum and ambergris, the all-natural perfumes created in the pre-synthetics era disappeared. The pre-1890 natural perfumer had a rather limited range of aromatics to choose from, as many of the Indian and Asian essences we now have easy access to were not used in western perfumery at that time. Today, champaca, lotus, ambrette, agarwood and many other exotics round out the number of botanicals available to the natural perfumer. That, along with the adoption of classic French techniques of blending using top, middle and base notes, helps differentiate the modern natural perfumer from the 19th Century one. A look back to the 19th Century would be little more than an intellectual exercise for a perfumer without the eternal beauty and complexity of the fragrant botanical extracts to kindle the fire of passion in the modern natural perfumer. Since aromatherapy had opened the doors of small-scale distribution of essential oils, all the natural perfumer had to do was nudge open a few more doors, and suppliers were providing them with concretes and absolutes, attars and other raw materials. The aromatic palette was complete, and the niche field of modern natural perfumery was launched. Some of the beginner natural perfumers liked, and had, all sorts of perfumes in their possession, from the classics like Chanel No. 5 to modern niche Serge Lutens creations. Still others professed a dislike to the strong sillage and diffusion modern perfumes. There was no common ground on like or dislike of perfumes containing synthetic chemical – only a professed love of natural aromatics. Yes, even though they had easy access to aromachemicals – synthetic versions of the naturals, and fantasy scents – they chose to work with only naturals. Your raw materials are very expensive. Your perfumes don’t last as long as those with synthetics, and they don’t have great diffusivity or sillage. The raw materials are difficult to work with. You’re artisans, often working out of a spare room in their house, isolated. You have to for the most part, train yourselves and fund your own business. You have to search out distribution networks, or, more realistically, depend on the internet or local stores for sales. You realize they’ll never get rich at this, or have a corporate safety net. We’re in it for the art. We regard the natural essences as providing the richest, most beautiful, complex, challenging liquid artform to work with. The fragrances evolve on the skin in a way synthetics don’t, and captive us with their slow, seductive nuances. We don’t like big-volume perfumes with a lot of sillage or diffusivity. We like subtle, complex aromatics that stay close to the wearer’s body and evolve slowly on the skin. We take delight and pleasure in experiencing a unique natural aromatic. The discovery and unlocking of a complex accord within a natural is rewarding. The ability to connect on a level that speaks to an eternal fragrance is wonderful e.g., the cypriol we use is the same cypriol that was used in ancient Egypt. The excitement of being in on the ground floor of a new art as it develops, and realizing that if we’ve come this far in approximately five years, how far we can go with natural perfumery in the next fifty? There is no competition with mainstream perfumery. We’re just two different artforms, like oil painting is different from digital art. There are completely different aesthetics, mediums and results, and so it is and will always continue to be. These parallel arts will always have things in common, such as the need to respond to market trends, sourcing, R&D, and the need to always keep learning, keep on top of the perfumery and keep current, and that is our common ground. Natural perfumers will always create for those who appreciate hand-made items from natural sources, and they are fortunate to live in the time of the internet and global transport that delivers raw aromatics and customers orders to their studio, allowing them to develop their art and business outside of the closed world of corporate perfumery schools. We have a pronounced advantage in our pioneering of tincturing and infusing rare botanicals for our own use. Natural perfumers are as apt to create their own jasmine bases and tuberose tinctures as buy it from the supplier, if they have a garden to grow the botanical in. Others are tincturing seeds and soil to recreate some of the more exotic scents out of India, such as ambrette and mitti, which is soil attar. And the clincher? Our mothers, who first turned us on to the world of perfume love our scents, and we now give back to them and their generation our liquid treasures, botanicals made liquid – naturally. This entry was posted in Anya McCoy, natural aromatics, natural perfume, raw materials of perfumery on January 12, 2017 by Anya. As head of the Natural Perfumers Guild, founder of the Natural Perfumery Institute, and a perfumer who only uses 100% natural aromatics in my perfumes, I am often asked about the differences between natural and mainstream (contain synthetics) perfumes. I created the following chart years ago for my textbook, and it’s a good, quick reference on the subject. The bottle may hold natural or mainstream perfume. It’s the customer’s decision based on preferences, scent, price, or lifestyle whether to purchase it – or not. History: Link to ancient Egypt, historical figures, use naturals in both ancient and modern style blends. Link to ancient Egypt, historical figures, use of synthetics to replace naturals began in 19th century. I hope this guide will clarify some issues on natural versus synthetic perfumes. If you have any questions on this issue, feel free to comment. If you want a quality education in natural perfumery, click here to read more. This entry was posted in Anya's Garden Perfumes, Healthy perfume, natural aromatics, natural perfume, raw materials of perfumery and tagged Aromatherapy, comparison between natural and synthetic perfumes, natural perfume, synthetic perfume on April 25, 2016 by Anya. Rachel on Destroying my Carolina Jessamine perfume plants! © Anya McCoy and Anya's Garden Perfumes Blog, 2006-2014. Unauthorized use and/or duplication of this material without express and written permission from this blog’s author and/or owner is strictly prohibited.